The apartments could use a little updating. Especially the appliances. Other than that the apartments are really decent. The neighborhood is nice and quiet. I was excited and thrilled when the maintenance man, Clint, came to the door recently and now all the repairs for which I have been waiting are getting done! Clint has been very helpful and personable! Shout out for Clint! Also, Heather and Brooke deserve a shout out for keeping and following up on the work orders. Our move in experience has been amazing! Staff has been friendly and attentive! So welcoming! As well! We moved from out of town and the staff has been so inviting and made us feel right at home. The apartments are a bit older, but it's mostly cosmetic issues. The complex is quiet, I have yet to hear neighbors through the walls. Would definitely recommend. I've had pretty good service. My garage ceiling is falling down and the roof needs re-shingled. The yard is full of stickers. Manager & staff are very nice and caring. 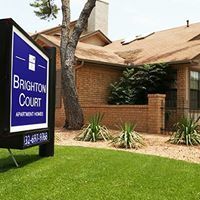 We have been at Brighton Court for about 2 weeks now, and we have really enjoyed the quiet atmosphere and friendly staff. We have not had to deal with maintenance so I am not sure how to rate that at this time. The best thing that happened when we came to Midland was Brooke Rowten. She made us feel heard, wanted and special. The only downside we have experienced is the slow maintenance but we understand the oilfield challenges. I really like living here. The apartments are big, and we have a nice yard for our dog. The people who work here are also very friendly. The only issues we have are because the place is kind of old we have issues like the kitchen was not caulked properly so a plant was growing in our kitchen, the sink in our wet bar had to be fixed, and small other things like that. Also, if you have an apartment with a skylight, which we do, your energy bill will be INSANE because so much heat gets let in by the sunroof. Having those put in was a bad call by brighton court. We love our home. It is perfect for us. However there is a major problem with ants and the pest control guys can’t seem to get it under control. We love the location and the office staff is amazing. We couldn’t ask for better management. Wonderful community. The apartments are very spacious and give off the feeling of living in a single family home. I have never had any issues with pests or noisy neighbors, so that’s a huge plus! Norma has been amazing! Our apartment was not up to par by all means! Very dirty! Missing parts to appliances so we cannot cook for our 4 kids! But I think that’s a maintenance issue! They desperately need more help and better communication! When we moved in 6 years ago there was a dedicated maintenance person for each property plus one person to oversee the other three. It was great, immediate service. Now not so much. Brighton Court watered all the trees and common property. Now it is turned off and everything is brown. All residences had their lawn mowed once a week. Now we get a weed eater for the grass every 2 or 3 weeks. Then there was a requirement for no large dogs (50 pound limit) on the property, now anything goes. Then there was a weekly walk through the property by management to ensure no trash build up and to simply attend to anything they saw. Not now. Current maintenance staff (two people) try but they are overwhelmed and need more help. Speeding on the property has become a problem. I hate the idea but speed bumps is an easy fix. If not at some point an adult or child is going to be injured. We love the location and have enjoyed the neighbors we have met. Ownership has changed many times, each time there is less for the residents. The only thing that has been consistent is the rent going up. Apartments are quiet in a nice neighborhood. The buildings are nice. Only complaint is outrageous rent and very slow to get maintenance work done. In general, very good. But I believe that could do more with regards to house maintenance. Also improve garden and surrounding / community maintenance. Great location. Wonderful staff that are always willing to help. Would have given 5 stars but the rental price is extremely high, but that is everywhere in Midland. These apartments are great. We have been very happy living here! Our neighbors are very pleasant and the staff has been very helpful when we have had any issues.